CHOLLEY Alpine Solar Defense – SPF 50 is a very effective antioxidant emulsion for the maximum protection of the skin against solar radiations. It uses a new technology that allows the creation of a light and very pleasant emulsion despite a high concentration of UVA and UVB filters. 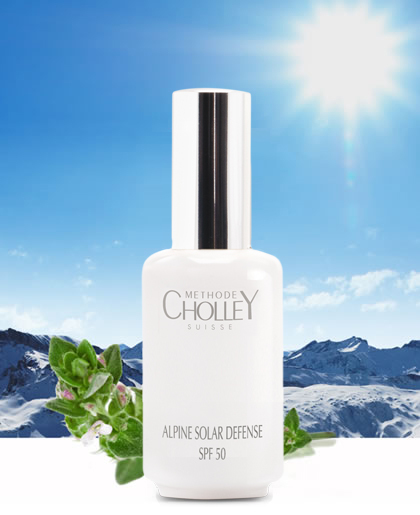 CHOLLEY Alpine Solar Defense – SPF 50 provides full-spectrum UVA and UVB protection for the skin. Use it as a finishing protective screen after daily cleansing and conditioning the skin with appropriate CHOLLEY daily care products. Ideal as a solar barrier for all skin types, all age-groups, and all ethnicities after the application of CHOLLEY daily care products. CHOLLEY Alpine Solar Defense – SPF 50 also contains Alpine Artimisia (Artemisia umbelliformis Lam. ), a phyto extract known for its anti-aging and antioxidant properties against stresses provoked by reactive oxygen. Artemisia grows in the Alps in altitudes between 2,000 and 3,200 meters. It is well-known for its healing properties and is very often considered next to Edelweiss (Leontopodium alpinum Cass. ), as the other symbol of the Alps.